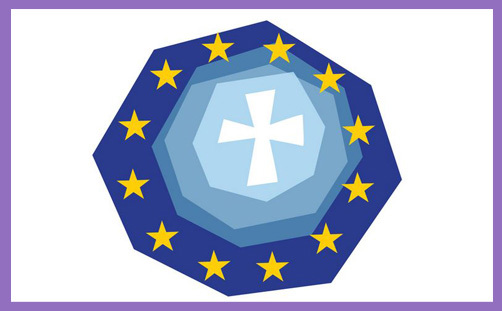 Its mission is to monitor the political processes of the European Union and the legal developments in all areas of interest for the Church. For the Church, a political project derives legitimacy from its impact on human persons – so the European project should be our project. In an anxious period like this, it’s vital to impose a framework which prevents national and corporatist egoisms from taking precedence over the quest for the common good. Whether they like it or not, our countries and peoples belong to Europe. The speaker was Fr Olivier Poquillon, General Secretary for the Bishops of The European Union. By “our” he means all faithful Roman Catholics. The “anxious period like this” to which he refers is Brexit, which he believes is contrary to the common good; indeed, an expression of national egoism. And then he spoils his sermon by conflating the EU with Europe. Whether Fr Poquillon likes it or not, the EU is (presently) composed of 28 nation states; Europe is made up of 49-51 states, depending on where you be believe the borders to be and what constitutes a state. Brexiteers are fully cognisant of the fact that the United Kingdom is part of Europe. Whether Fr Poquillon likes it or not, Switzerland, Norway, Liechtenstein (etc., etc) are peoples who belong to Europe but have no desire to belong to the European Union. A bit like Vatican City, really. Honestly, how can the COMECE General Secretary presume to lecture British Roman Catholics on their moral obligation to support European Integration when the Holy See fiercely guards its own ancient sovereignty and permits nothing to impinge upon its corporatist egoism? Defiance of institutions isn’t specific to the EU – it’s a global phenomenon, which also affects the Church, enterprises and states. Brexit is merely the European expression of something we’ve seen in the US and other countries: sensing a loss of control over our political, cultural, religious and technological environment, we’re strongly tempted to withdraw into ourselves. It is hard to understand how someone so manifestly intelligent and spiritually discerning does not see or apparently understand that ever-closer European integration is the fons et origo of the “loss of control” felt by many Britons who voted Leave. He lauds subsidiarity as though the fact that it is written into the Maastricht Treaty is evidence of its political exercise and virtuous operation. Subsidiarity – the principle that a central authority should have a subsidiary function, performing only those tasks which cannot be performed at a more local level – is antithetical to ever-closer union. Indeed, the latter challenges and nullifies the former: the two cannot co-exist. ‘And for this cause God shall send them strong delusion, that they should believe a lie...’ (2Thess 2:11). The EU may have enshrined the political principle in its 1992/3 amendment to the Treaty of Rome, but in practice subsidiarity is non-existent. Can Fr Poquillon name one – just one – power accrued to the Acquis which has been re-devolved to the level of the nation state? Honestly, doesn’t DEFRA and Buckinghamshire County Council have a better grasp on how to deal with brown long-eared bats in a Beaconsfield belfry than the European Commission? Why do we need an EU directive to protect chiroptera habitats? Is the Commission’s trust in subsidiarity so feeble that a national government department and a local council must ‘lose control‘ over how best to balance the needs of the bat with the preservation of church fabric and historic artifacts? The European Union Acquis is ever-evolving, as it necessarily must with ever-closer union. Since Brexit, Jean-Claude Juncker has confirmed his vision to proceed to full political union – one president, one parliament, one people – complete with an EU ‘defence union’ (ie an army), under EU command (ie that of the President).